The Buzz: A Beautiful Mess! Hello Friends! No card today but, I wanted to show you what I've been doing. Now this is stepping waaaaay out of my comfort zone but, I'm trying to grow. 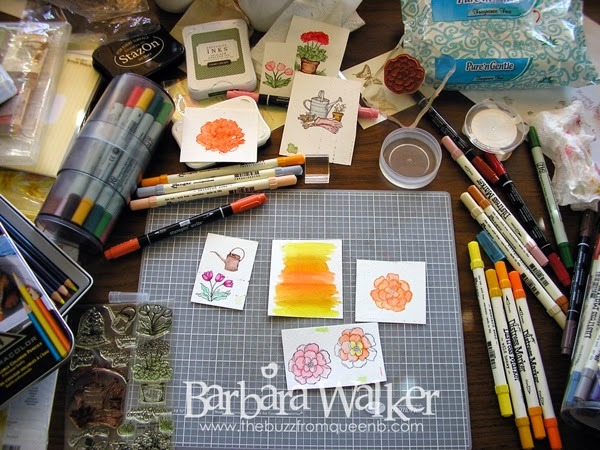 Sooo...one week from today, I will start another Online Card Class called Watercolor for Card Makers. I am so very excited about this class! I love the look of watercoloring on cards and when I saw this class pop up, I knew I had to be part of it. If you've ever wanted to learn about watercoloring, consider signing up for this class. There will be awesome teachers, like Kristina Werner and Jennifer McGuire! And there are some fabulous guest artists teaching classes, as well, like Tim Holtz! TIM HOLTZ!! Yes, you read that correctly! TIM HOLTZ. To read more about the class click HERE. There is a cool video there showing how the UBER talented Jenn Rzasa created the logo for the class. One of our pre-class assignments was for us to just play with the watercoloring media we already owned. This class is not about running out and buying tons of new supplies, it's about looking at what you have and putting it to use. I love that! So that is exactly what I did. I don't own any actual watercolors. Nope! Sure don't! But I do have plenty of other media that I can use for watercoloring; Distress Ink pads and markers, Inktense Pencils, Prisma Color Watercolor pencils, re-inkers, dye ink pads and blender pens. Sooo I selected a few stamp sets and pulled out my colors and just sat down and played. I thought I would take a few pictures of my beautiful mess! This was so freeing for me and quite out of character for my card making. I am usually a very neat crafter; I bring only what I need for my current project to my work area and then I clean up when I'm finished. So having all this stuff out was a bit unnerving at first, but I just had fun and went with it. I tried several different things, testing different inks and seeing what kind of results they produced. It was very fun! I had no specific destination in mind...just enjoying the journey! If you decide to join the class, let me know! I'd love to see your artwork. Oh wow, Barb! I'm sure you are going to learn so much in this class. 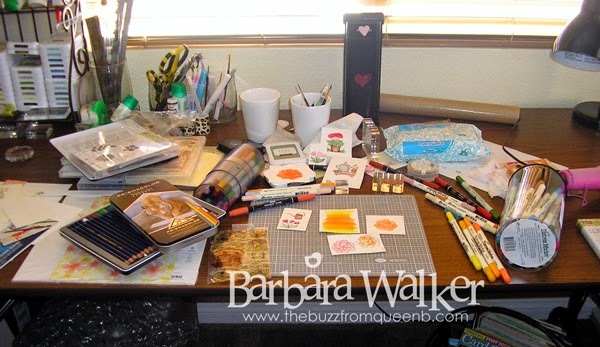 I loved the peek into your crafty space. Thanks for stepping out of your comfort zone to learn and grow and gathering up your courage to share a little bit of that journey here. You are awesome! I really like what you have created. Can't wait to see more (I hope you'll share).